Qatar, the peninsula Arab country provide perfect ambience for business that attracts millions of investment opportunity. For this reason, there are many people who come up with different business set ups and plan to establish their business abroad and this is when the attestation services play major role. Certificate attestation are essential when it comes to going abroad and setting up a business legally .The attestation procedure makes your process of starting a business. The first and the foremost step is to register your trade name. Make sure you trade is unique to avoid unnecessary confusions. Also the name has to be apt for the type of business you are going to start. After getting your business/trade name, next step is to get approval from the department of Economic development. Only after the approval your business related documents can you obtain your license. After completing the main attestation procedures, the documents has to be translated to the respective country’s official language as it is essential for the government officials to understand your documents for it to be verified. 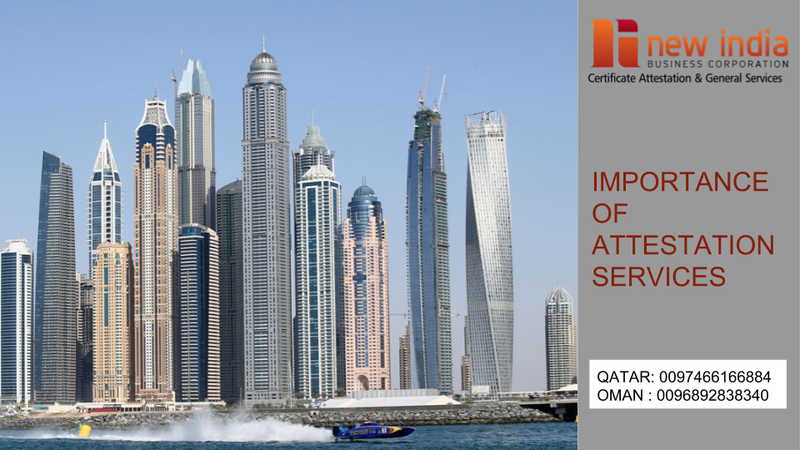 Similar to other countries, For going to Qatar authentic attestation services are required to certify their necessary documents. There are certain procedures to certify the documents in Qatar. Verification of which is a strict proceeding. The procedure for obtaining the Business attestation services are similar to that of the general attestation services. Approval for the department of the Economic development. New India provides its customers with the facility of free collection and delivery of your document. There are no extra charges. Another facility they provide is the tracking of the necessary documents. If you want to know the current status of your document parcel delivery. Payment after delivery is another facility provided by the New India Attestations. If your document is damaged or lost during the delivery you can get the Insurance of the lost document. Immediately after the birth of the child his/her certificate should be registered and this has to be attested to consider it as valid. The salary certificate of a person is considered valid only if it is attested by the government officials. Marriage certificate attestation is required for a couple if they are planning to move abroad. The transfer certificate issued by schools or any other institution is considered valid in abroad when it attested by the concerned authorities. The education certificates include degree certificates and other school certificates. For working in abroad one needs to attest their education certificates to consider them valid abroad. PRO services is very important in abroad as they require services of government officer/Public relations officer for paper works such as visa applications, labor card etc in countries like Qatar, Oman etc. Soon after getting the death certificate, it has to be attested by the government officials to consider the certificate authentic. The legal document consisting of an individual’s bank details and income details Pan card service is provided by the New India attestation services within the frame time of 15 days. Experience certificate attestation is very important as this certifies that the experience certificate of a person is signed and sealed by concerned departments or authority. In some countries medical report is considered to be a mandatory process by the employers abroad. In case of medical emergencies, when the person is on medical leave and away from his working country. With Attested medical report his/her leave is authenticated. Hence these are some of the other services of New India attestation services company apart from Business attestation services.